A posh bedroom retreat blends color and imagination at this Los Angeles residence, designed by Steven Cordrey. 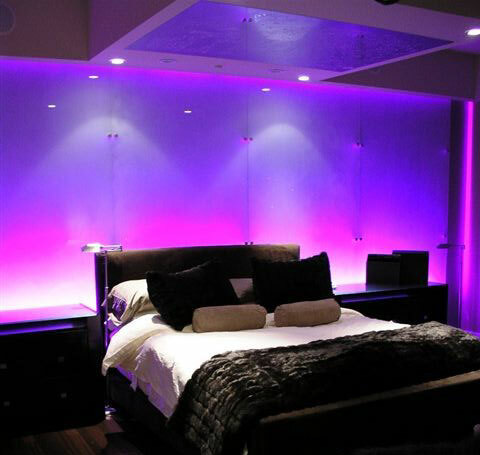 Color Kinetics’ intelligent LED illumination allows the homeowner to control the room’s mood at his fingertips – ranging from subtle color fades to fixed shades of blue, violet, and millions more. The elegant design called for iColor® Cove to illuminate a sheet of glass that’s mounted to the wall behind the bed. The 6- and 12-inch units of iColor Cove are mounted around the perimeter of the glass, which seemingly glows from within. The individually controllable units allow for continuous streams of color, and their long-life, low-heat, low-maintenance nature allows their installation in difficult-to-reach or concealed spaces. Cordrey designed customized lighting effects that are stored and triggered by iPlayer® 2 with a simple Controller Keypad interface. As a result, the homeowner can easily choose up to eight stored light shows that create varying looks for the room – much like painting with light.